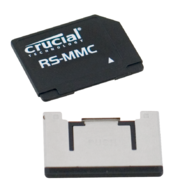 RS-MMC has been superseeded by MMCmobile. Which is backward compatible with RS-MMC, but has 13 pins instead of 7. Size is 24mm x 18mm x 1.4mm. Note: Direction is memory card relative to host.